The black yoke with mirror work in three colours is completed.The colours used are lemon yellow, medium green and medium mauve. the yoke outlines are done in cream. I could have used many colour combinations with this cream and black background.I could have also embroidered over the printed pattern on the fabric too. This is just to think of different options. 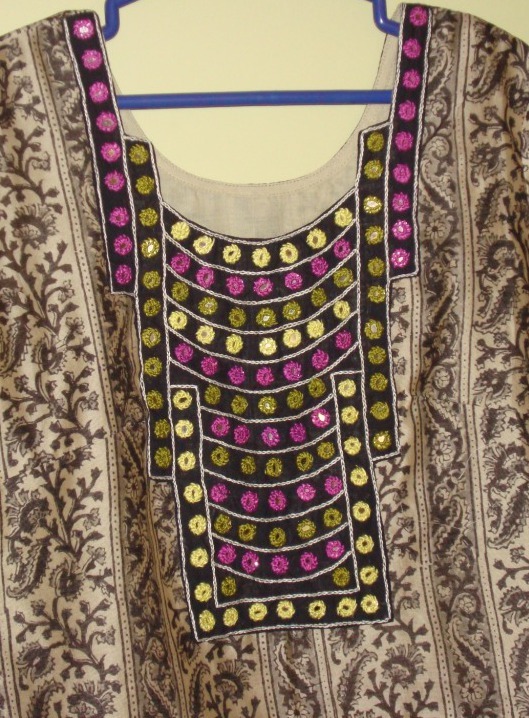 The tunic would have looked good even without any type of embroidery. If that were the case , there wouldn’t have been anything to blog about, it would have just been worn. 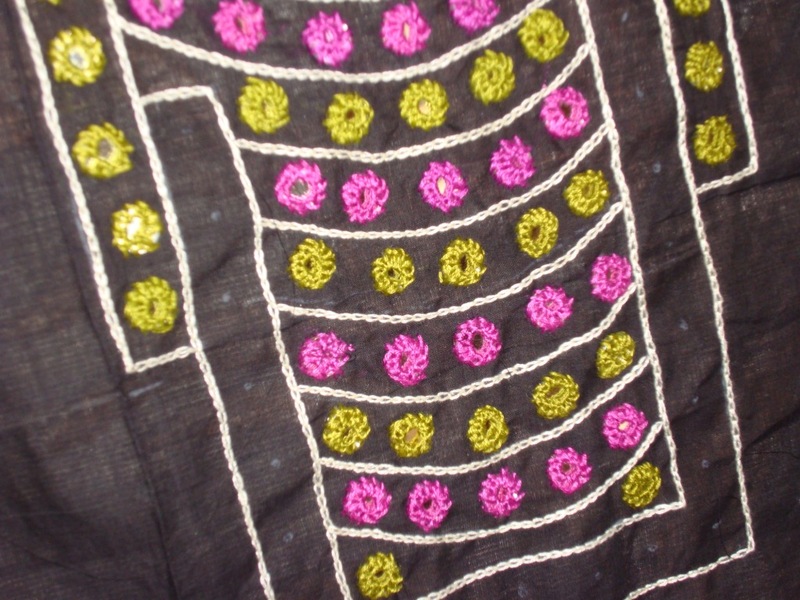 This tunic fabric is chanderi cotton & silk mix. 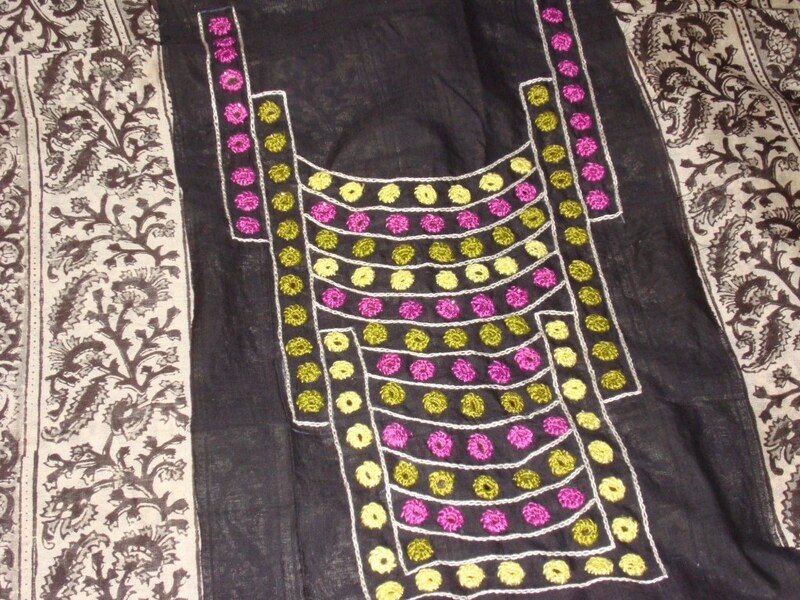 Things I know are it comes from a place called Chanderi,it is a woven fabric, on which textile prints are done,quite delicate , to be worn as dress needs lining. I have seen many chanderi sarees, and these days,chanderi dress materials are also available. When I wanted to design a yoke for this tunic,inspiration was at its all time low. It was nil actually! Then , mirror work was chosen. Designing was very minimum,just placing of the mirrors in rows. How well the yoke does not match the tunic will be seen on my next post!